Hayes & Yeading bounced back superbly from last weeks defeat at Luton to complete a "double" over promotion chasing Oxford United at Church Road on Good Friday afternoon. With skipper Tom Cadmore suspended, the central partnership was Ed Harris and Matt Ruby who were flanked by the regular full-back pairing. Injuries to Justin Cochrane and Esmond James saw a first start for youth team captain Nathan Webb on the right of midfield and a return on the opposite flank for Dale Binns. Up front saw Steve Basham back in situ with James Mulley in support from midfield. The game started at quite a sedate pace and despite a lot of possession by the home side the only chance of the first fifteen minutes saw an Adam green free-kick fielded by U's keeper Ryan Clarke. The visitors could then have taken the lead on 17 minutes when a long Clarke kick from the back was helped on by Lewis Chalmers to James Constable who controlled the ball in the area and worked space for a shot that went side of the target. 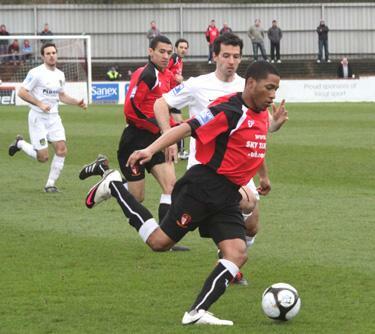 The game was to take a massive Hayes & Yeading turn on 18 minutes though when Oxford's Matt Green, having been booked just two minutes earlier for persistent foul play, went into a challenge with Matt Ruby with both feet off the ground and referee Cooper duly dealt him a second yellow and subsequent red card. Not deterred by the reduction in manpower, Oxford's game seemed to improve and just before the half hour mark Constable sent Potter down the left and his well hit cross was missed by Chalmers by the smallest of margins. Ten minutes before the break the visitors had a let off as a Marc Canham corner struck Mark Creighton in the six yard box and the ball bounced kindly to his teammate who hacked it clear. Two minutes later it was Hayes & Yeading who had a massive let off as Chalmers rose to an Adam Chapman free-kick, the ball striking the inside of Clark Masters upright before being played to safety. With stoppage time almost upon us, an aerial challenge between Ed Harris and Oxford's Simon Clist led to a clash of heads that was to result in the Oxford man being replaced by Francis Green. This soon proved perfect for the visitors as Green's first touch sent Constable through at goal, Masters came to meet him but the striker managed to hook the ball past him and into the net, Masters collecting a caution for felling the striker in the process of scoring. Still three minutes of stoppage time remained and Ram Marwa went close to pulling it level as he received from Danny Allen-Page and hit a shot on the turn that Clarke did well to push away at full stretch. Marwa was not to be denied however and just over 60 seconds of the second half had been played when he did get his name on the scoresheet with just his second of the season. Green and Binns switched passes in the left corner before the former fired a deep cross that Oxford's defence seemed to stand and watch as Marwa threw himself into a diving header that nestled in the bottom corner of Clarke's net. 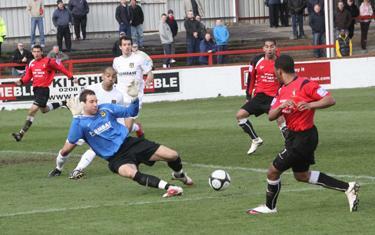 Hayes & Yeading were now in the mood for another. Steve Basham sent James Mulley forwards, the ball being played square to Allen-Page who tried his luck from 30 yards out, his shot dipping just over the U's crossbar. The visitors did however strike the woodwork again minutes later when a Chapman free-kick beat Masters only to go wide off the right-hand post. The decisive blow was struck just before the midway point in the half. Allen-Page found Webb and the right, his pass into the area found Marwa who turned his marker before firing past Clarke from twelve yards to give the home side the lead (pictured below). Despite the visitors numerical disadvantage play continued to sweep from end to end. A long Harris pass found substitute Charlie Ide who headed the ball into his own run before seeing Clarke keep out his shot. At the other end a perfectly timed sliding tackle from Ruby denied a rampaging Constable as the two raced side by side into the area. Binns was presented with a good chance on 81 minutes by Ide, the wide man’s driven shot being pushed away by Clarke and then at the other end with time running out a Constable flick on saw Sam Deering attempt an overhead kick that Masters was grateful to grasp at the second attempt to seal victory for the home side. 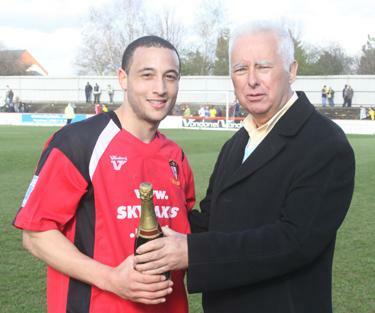 Sponsors Man of the Match: Danny Allen-Page.